Glen Moray is a Speyside distillery, located just outside of Elgin. It started life as the Elgin West Brewery, but in 1897 was reborn as a spirit maker – it was presumably at this point that it acquired the Glen Moray name, because I suppose even in the 19th century somebody in marketing felt that a ‘Glen’ name would make it more saleable. Their current output consists of three ranges. The Elgin Classic whiskies have no age statements and are mostly focused on different cask finishes, while the Elgin Heritage collection offer the more traditional 12/15/18 year old age range. The final ‘range’ – the Elgin Reserve – actually consists of a single whisky in the form of a 25 year old tawny port cask whisky which I have to confess does rather catch my eye! The Elgin Classic Sherry Cask Finish is from the first of these ranges, finishing off it’s maturation in Oloroso sherry casks and bottled at a fairly reserved 40% ABV. 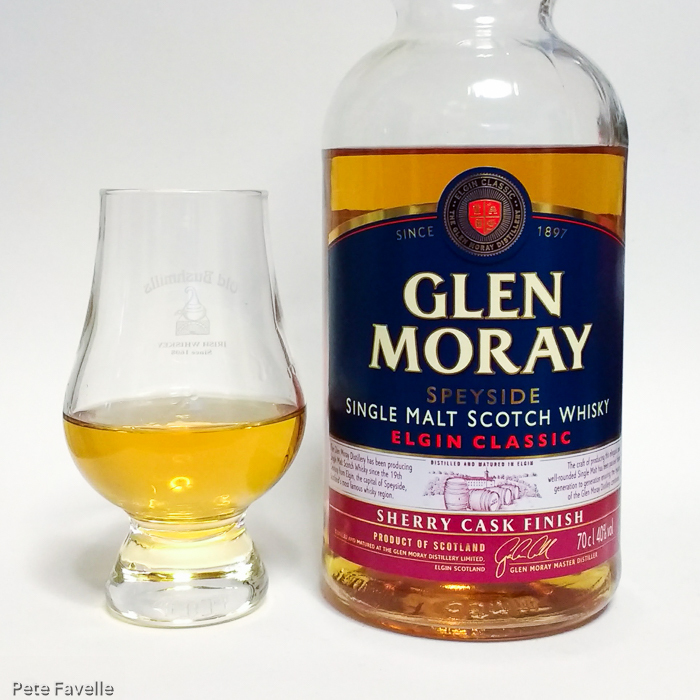 The nose isn’t heavily sherried – light vanilla fudge with just a little dried barley initially, although as it sits in the glass some raisin character starts to emerge too. Watered, more oak notes appear along with a hint of fresh ginger but the sweet fudge is lost. In the mouth it’s buttery toffee and dark chocolate, leading into a very gentle but lingering spicy finish. With water it’s a little diminished; again, wood notes replace the sweetness and the finish is somehow a little harsher. Definitely one to enjoy straight, it’s light and uncomplicated but very easy drinking. The sherry finish really doesn’t come through, which is a shame – I’d hoped for some more obvious fruit notes. Still, for the price – you should be able to find this for well under £30 – it’s a pretty decent budget dram. 3.5 stars.